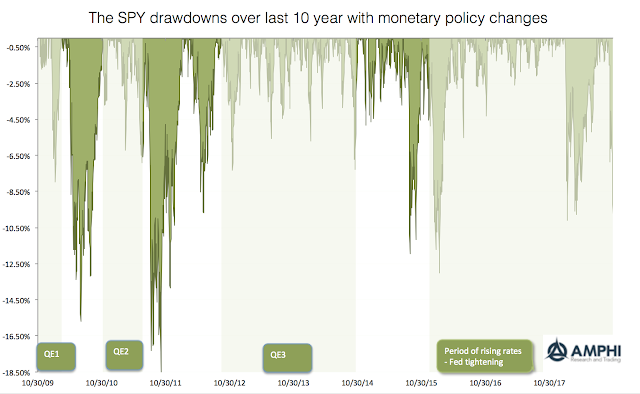 Our graph looks at the drawdowns for the equity benchmark SPY over the last ten years. While the current drawdown has come fast, there are have been a number of drawdowns that have been far worse albeit none that have reached the magic 20 percent market correction level. There is reason to be concerned, but investors need to have perspective. Nevertheless, we have noticed that the largest drawdowns were associated with periods when the Fed was not generating more liquidity. During the transition period between QE1 and QE2, there was a 15% drawdown. During the transition period between QE2 and QE3, there was a 18+% drawdown. The next four largest drawdowns occurred after the Fed stopped quantitative easing. 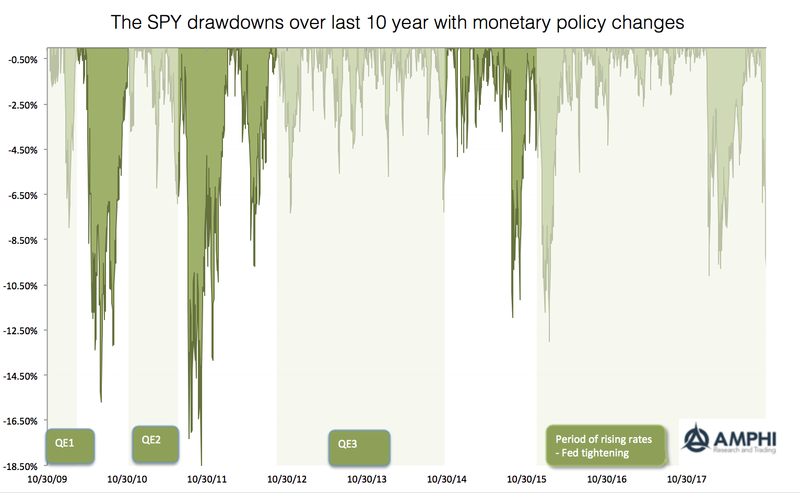 The periods of quantitative easing were drawdown exceptional because there were no large drawdowns. We are now in a more normal environment, more risk, larger drawdowns, and more uncertainty. Skill is what you have when things go right. Luck is what you don't have when things go wrong. Probability does not have a personality. Skill versus luck. Over confidence versus luck. Hot hands versus luck. Probabilities versus luck. There are many combinations of what probabilistic success means, but the one thing that a trader should never have or depend upon is luck. He has the odds or he does not. You will win more than you lose if your odds are favorable; assuming you handicap properly and you size the risks properly. Skill is about handicapping probabilities correctly and then knowing how to size bets properly. If you handicap a high (low) chance of success, bets will be larger (smaller). Handicapping and sizing go hand in hand. If you are more successful than anticipated, you likely undersized your positions. If you are less successful at prediction, then you likely oversized your positions. There is no luck. There is just knowing your abilities to handicaps and place appropriate wagers. There is no good luck or bad luck, there is only misjudging of probabilities and misweighing bets. If there such a thing as luck, good or bad, it is associated with the error with your guesses. The mistakes either work or don't work and that is the measure of "luck". Ford versus Starbucks - Uniqueness in money management is it necessary? 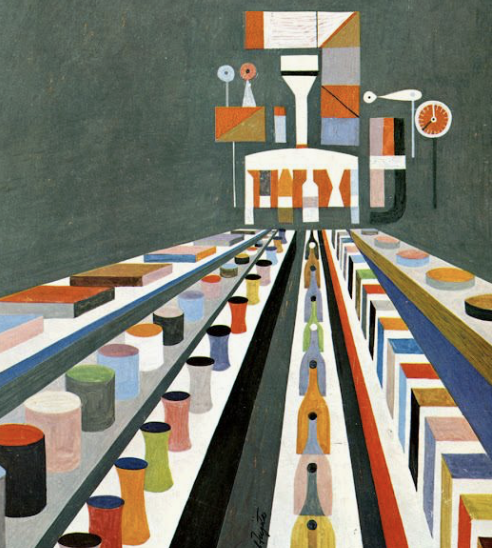 The changes in the product mix and delivery of goods in the new economy are profound versus the old economy. The old economy was about scale and creating sameness to cut costs. Henry Ford did not care which car you bought as long as it was black. The new economy of Starbucks is all about offering unique experiences and customization. 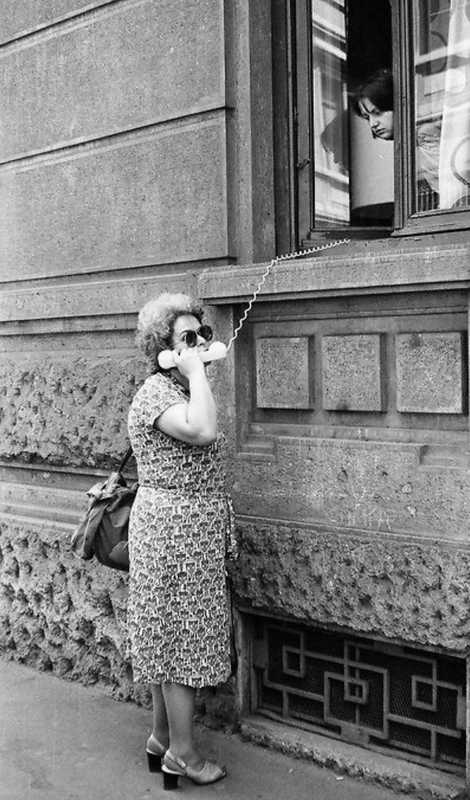 Of course, there always was product differentiation between these two extremes, but the operative behavior today is customization and uniqueness. The era of money management customization can be measured by the number of mutual funds and ETF's available for investors. There are now over 9000 mutual funds not counting all share classes and 2000 ETFs as of the beginning of the year. For new specialized products like "smart beta", the number is closing in on a thousand. 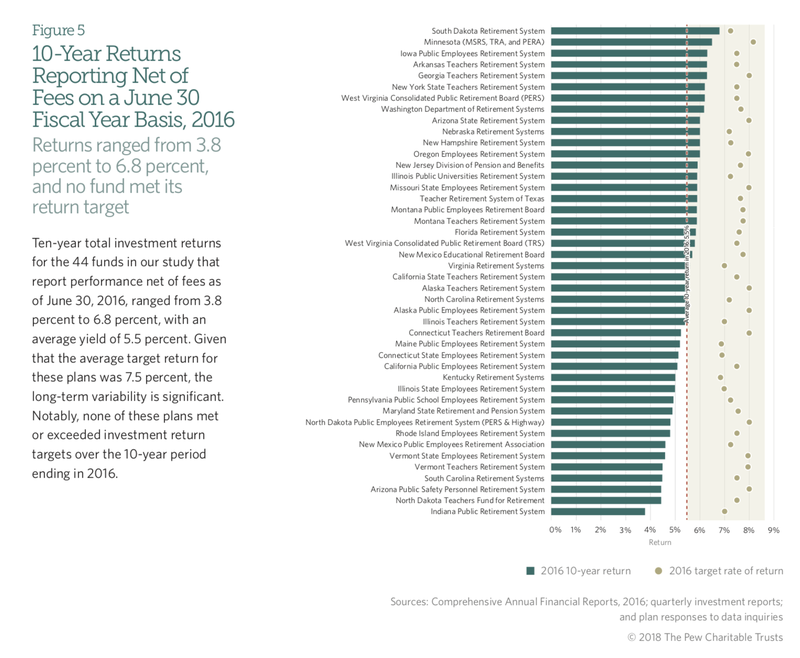 Unfortunately, many of these funds are not unique but rather variations on same theme or benchmarks offered by different fund companies. Still, the era of customization is continuing. 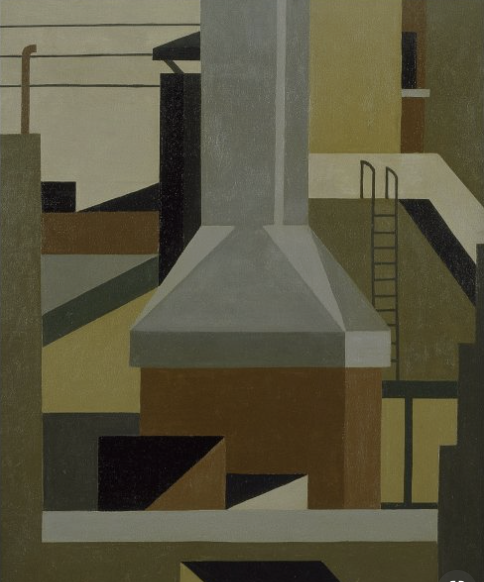 Classic Betrand competition leads to more competition in order to reduce price competition. Even in a winner-take-all environment differentiation exists to gain market share and maintain prices through slight differentiation. Everyone is special and wants something special and firms are trying to deliver on this desire to hold the line on price. There is no question that investor needs and risk preferences are often unique and customization can fulfill those specific needs; however, there are costs with creating uniqueness. On a micro level, customization will be more expensive so uniqueness will come at a price. Additionally, it is not clear how to benchmark uniqueness. By definition it should behave like a general benchmark; consequently, it is hard to determine whether dispersion is good or bad. In hedge fund land, there are hundreds of managers who are all offering what may be the same risk premia. How many managers need to offer value or FX carry? How many trend-followers are needed? Each may offer a different return "experience" but are they really just replicating the same underlying alternative risk premia? The proof is in the uniqueness of returns, but the extra choice may not worth it. Risk will surprise you. It is supposed to do this. While we always think of volatility as risk, the real measure of risk is the downside surprise that moves markets beyond what volatility expects. Risk is really when you expect certain scenarios and pay-offs and the actual event is much different and not anticipated. This is why the core risk management tool has to be diversification. Diversification protects you from the risks that were not anticipated. You can search for risks, but you generally will not find the harmful ones in time to adjust your portfolio. You may identify the risks, but you may not get the timing right for the events. Of course, we are now hearing from all those astute managers that fully anticipated the equity decline, but in reality, the size of the decline caught most by surprise. It was beyond the volatility measures used at the beginning of the month. There were some clues, but most of the evidence did not suggest a reversal of the year's gains. 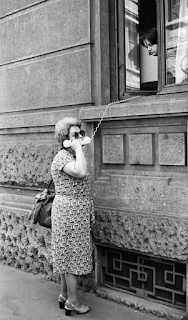 Diversification was the only way to escape the decline. Emerging markets were talked about in many 2018 forecasts as the place to increase allocations both for bonds and stocks, yet that recommendation has been a performance disaster for many investors. For both the last year and for longer investment periods, EM has not matched the performance of DM equities or bonds. 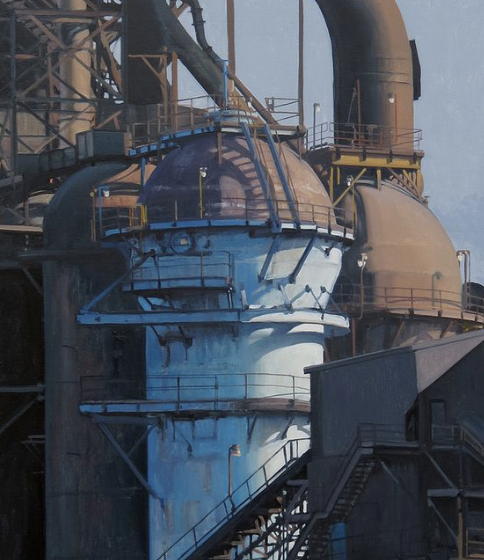 The current causes are many: trade wars scares, low commodity prices, a strong dollar and currency crises, over leverage, slower recent growth, and some strong geopolitical blow-ups. There are strong risks present, yet the arc of economic progress and convergence is still in place for those who think in the long-run. There are many reasons to support EM investing but one of key long-run reason is the convergence of economic growth. The gap between EM and DM income levels is closing and will continue to close. For example, see the latest work on growth convergence, "Everything you know about cross-country convergence is (now) wrong". 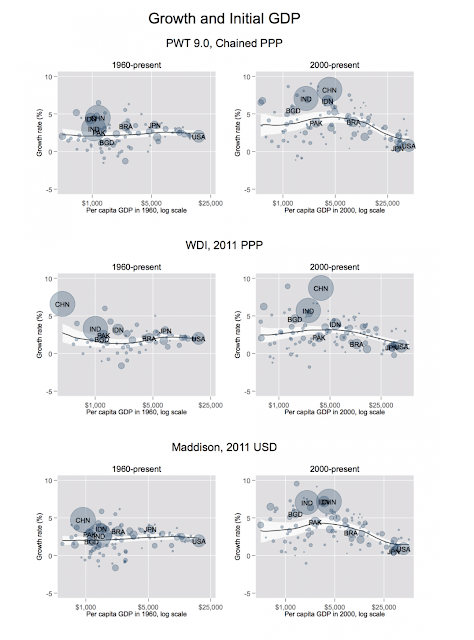 A standard view is that the middle-income countries have a hard time continuing high growth. Thus, the convergence of real per capita GDP is harder to achieve. The recent data does not support this claim. The channels of monetary policy are more important for any investigation of the macro economy. This is one of the key lessons from the Financial Crisis. Now that short-term rates are finally moving higher, the behavior of banks with respect to their lending activities becomes more critical. It is expected that as rates move higher, the demand for loans will be lower. Additionally, there may be a tightening of lending when rates move higher. How tight will lending become as rates rise? 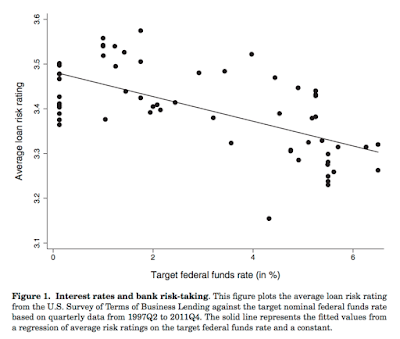 There is limited analysis on this question, but a Journal of Finance paper, "Bank Leverage and Monetary Policy's Risk-Taking Channel: Evidence from the United States" suggests the higher rates will take a bite out of riskier lending. This is important because there is so much debt that will have to be refinanced at higher rates. 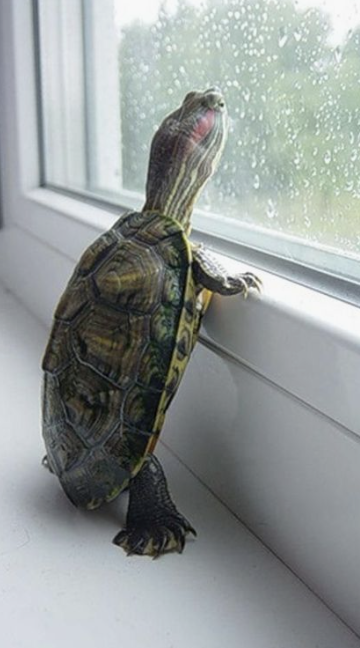 There will be a day when debtors will need more money or have to rollover existing debt. They may know that the price paid for that debt will be higher, but the real question is whether the quantity will be available. 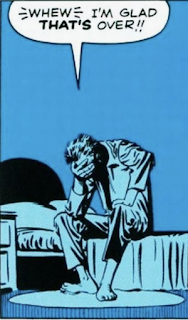 Past research says there will be a day of reckoning; however, that day has not yet come. 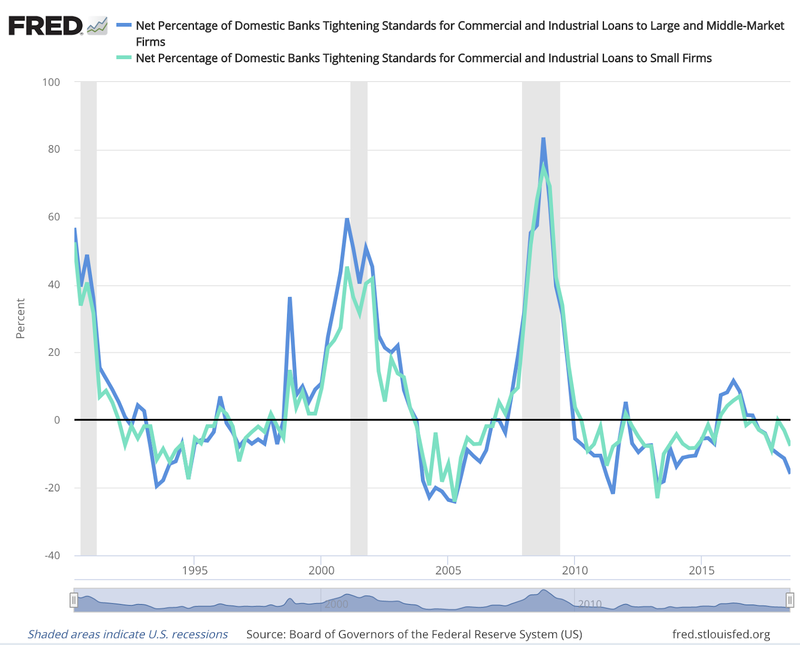 A review of domestic loan tightening standards suggests that at this point there is nothing wrong with the supply of credit. There is no tightening. You can warn about credit, but any action on this warning may be early. Investors may avoid fixed income based on the the direction of rates, but right now, the risk of banks not providing credit as a reason to avoid seems to be limited. Decision-making will be filled with mistakes and failure. It is part of the process when making bets in an uncertain environment. No one is 100% certain and at your best, your track record will match your estimates for success. The objective of good investment decision-making is to get the process right, so failure or lack of success is not from lack of skill or outright ignorance. Nevertheless, even if the odds are in your favor, you will not get every decision right. The risks are higher for hedge funds because they generally are not managed to a benchmark and should have greater active shares, differences in allocations from some benchmark. The performance costs as a measure of being wrong are higher because they should not be hugging a benchmark. The stakes are higher for hedge funds because pay is tied to performance incentive fees, and given the competitive nature and size of firms, performance failure will lead quickly to a loss of revenue and assets. The number of hedge fund closings, both large and small, has increased, as their costs of failure have increased. The industry has become more competitive because investors are less willing to pay for risk factor investing by hedge funds. The demands for skill are greater today than ten years ago. Absolute return is the name of the game. The pain from failure is more real and immediate, yet hedge fund performance, on average, has not been overly rewarding. Could it be that the average hedge fund is not taking enough risk? Volatility is generally low relative to the market beta but measures of active shares still suggest strong diversification over highly concentrated bets. Oddly, as hedge fund categorization has increased, firm returns may have become more clustered than in the past. Value managers are less likely to switch to growth and value managers may look more like their peers. Hence, there is less unique risk-taking. Perhaps hedge funds, especially as they have gotten bigger, have diversified away so much risk that after accounting for beta benchmarks and factor risks there is no alpha. Current alpha measures suggest that either there is limited skill or not enough risk-taking. Skill is masked by not taking bets away from core style factors. The complaint today from investors may be that hedge funds are trying to be too safe in order to protect their businesses. The BlackRock Global Risk Indicator is an interesting measure of uncertainty through looking at key work searches across a broad number of market news sources. I cannot say that this is a risk measure. Rather, the indicator is a measure of geopolitical negative news focus. It is a sentiment indicator that may lead to risk, as measured by negative market performance. Key words that represent geopolitical risks are chosen for measurement. These key topics that are then smoothed by a market sentiment measure which accounts for positive and negative biases to these news stories. The data is then normalized to provide a measure of positive and negative geopolitical sentiment. This risk indicator is one of growing number of measures using natural language processing to find trends in news. The use of key word counts from news and social media is innovative and quantitative, and it provides some form of precision to the inexact measure of market sentiment to news. Opinions and views are turned into quantitative measures. Whether it is useful at forecasting the direction of markets is suspect. A number of geopolitical events are measured, but the appropriate weight given each topic is hard to define. My suspicions are that the forecasting quality of this index is mixed. It is not because I don’t believe that this can be done, rather I have not seen the evidence. Any quantitative analyst would like “hard” analysis to support data. This indicator is better than polling, but it is not clear there is a causal link between highlighted news as measured, focus on geopolitical topics, and market activity. The latest data shows a very benign or neutral environment for the market. If there a cause for the current market decline, it is not coming from geopolitical risks. Simple visuals can be very powerful at telling an effective investment story. 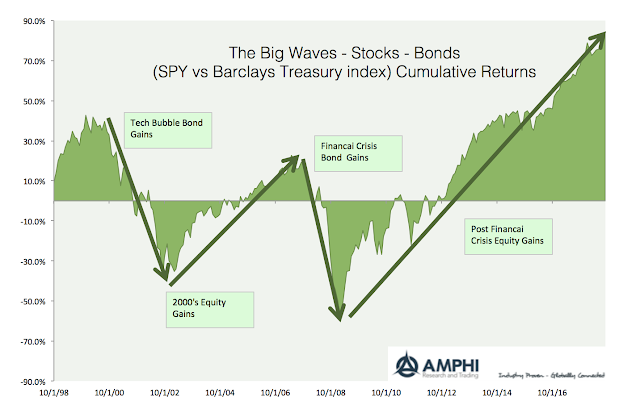 I have compared equities, bonds, and commodity relative returns for the last twenty years to see the big wave cycles that investors needed to participate in to have a successful portfolio. The trends from these asset class cycles are long. An investor does not have to get in on the turning points, but they do need to hold the trends as long as possible. The secret to relative asset class success is commitment. There were four long stock/bond waves for investors. First, there was the decline after the tech bubble which lasted until the fourth quarter of 2012. This period was followed by the rally before the Financial Crisis. The Financial Crisis generated a sharp decline in cumulative returns. The post Financial Crisis rally is notable for the size and length of the reversal. It is still ongoing. These major asset class waves are well known. 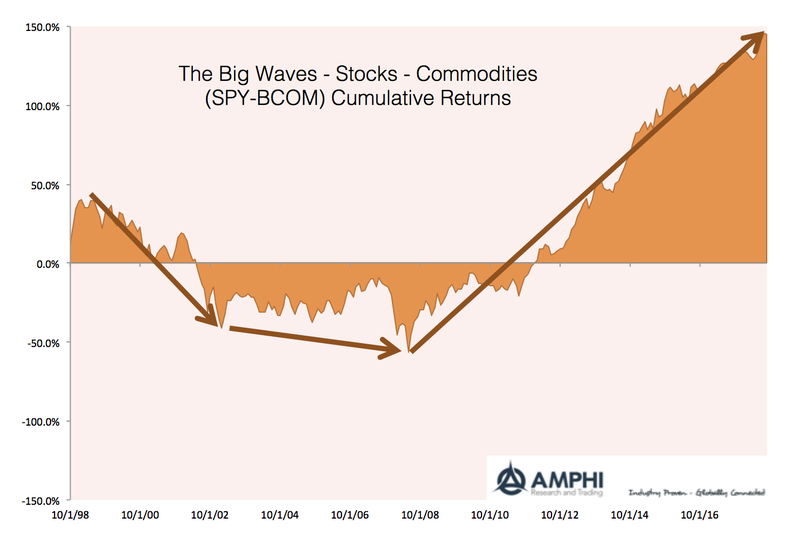 The stock/commodity waves are less well know but much larger. There were only two major waves: the commodity super-cycle gain and the reversal since the Financial Crisis. The extended rally in equities over commodities is outsized relative to anything seen in the prior decade. While the size of the equity gains seems over-extended, it actually is a reflection of the structural change in commodity usage. 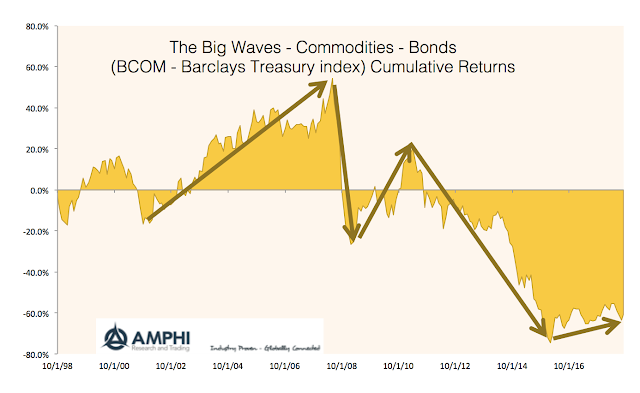 The relationship between commodities and bonds is muted relative to equities but tells a more complex story. Commodities outperformed bonds during the super-cycle only to reverse during the Financial Crisis. However, there was a mini-rally after the Crisis followed by the cycle adjustment. More recently, we are seeing small gains versus bonds and switch back to commodities. Regardless the type of investor: trend-follower, value, passive or active, the large waves in relative performance affect the larger portfolio composition and performance. Simple assumptions to some classic monetary models will produce very different policy views for the direction of Fed action. These significant policy divergences are the reason for the recent pick-up in bond trading. A dispersion of opinions on Fed action will lead to more volatility, trading, and potential rewards in these markets. These policy divergences even exist within the Fed. For example, a recent speech by St. Louis Fed President Bullard, "Modernizing Monetary Policy Rules", on October 18th shows the inconsistency on what the Fed may do in 2019. These differences in "forward guidance" across Fed presidents are nothing new, but this speech shows the stark divergences in opinion using simple assumptions. When the Fed funds rate was at the zero bound, there was no confusion that rates would have to move higher. It was just a matter of timing. Now, even with Fed gradualism, it is less clear whether the current path will continue. Bullard takes the standard Taylor Rule model, which includes the neutral rate of interest (r-star), the policy rate for inflation, an inflation gap term, and an output gap term, and changes a few assumptions to get a new recommended nominal rate of interest for Fed funds. He lowers r-star, reduces the Phillips Curve effect, and further grounds inflation expectations. Lowering r-star given long-term growth and demographics means the nominal equilibrium policy rate will be lower. Accounting for a lower Phillips curve effect makes the output gap less important. Better measures for inflation expectations suggest that expectations are well-grounded and there is less work required by the Fed to reach equilibrium policy rates. 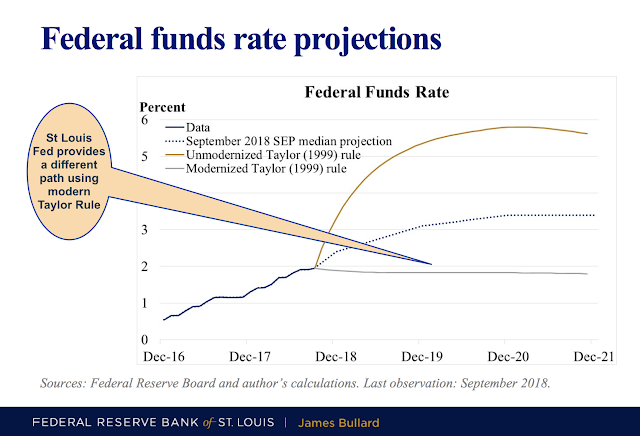 Modernizing the Taylor Rule to reflect current market behavior and thinking suggests that the Fed funds rate path should be flat. No need for further Fed tightening given current information. This is at odds with the old rule that shows a higher path and the SEP median projections which forecast higher rates. If the Fed follows this new Taylor Rule, it should place a hold on further increases and forward rates should come down. There should be a strong reaction away from conventional wisdom in both bond and currency markets. While the view expressed in this paper is not the consensus, the modernized Taylor Rule suggests a Fed hold could be a real possibility. The concept of investment narratives has been given a bad reputation especially by quants, yet these stories are often the glue that holds together data. Quants say, "Only look at the data", yet the data may only be useful through words that extend meaning to the data. Many investors will not be accept facts and output from models without a good narrative. Models are fundamental to good investment decision-making. Models impose discipline and structure on action, but the action necessitated by a model requires a story for how it fits within the context of the marketplace. Models often leave a lot of variation unexplained. The story fills in the blanks between data, models, and opportunity. Models are simplifications. They offer a shorthand at explaining the world. Empirical models simplify regularities found within data, but these simplifications need a way to be imprinted in the brain when action is needed. Stories create a memory imprint and excitement that is not present when just looking at data differences. Some may say that the narrative is excessive and adds bias. 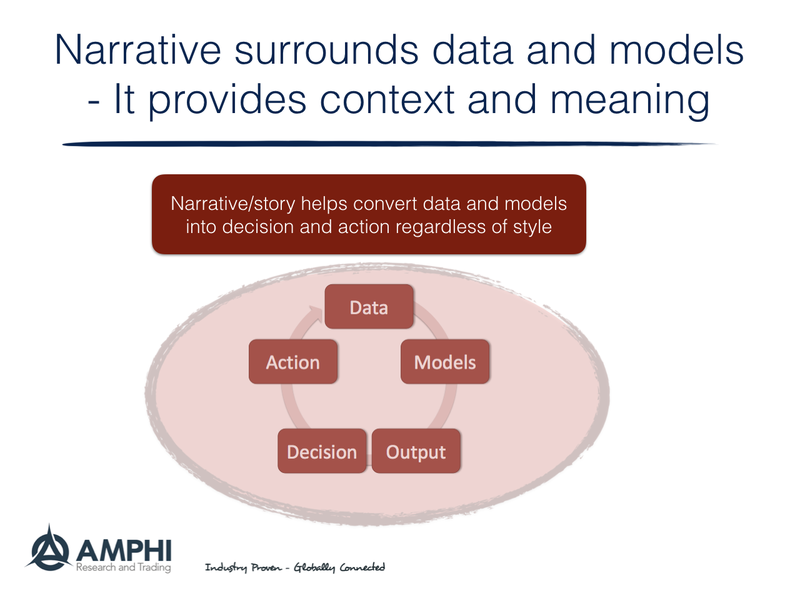 There is no question that stories can embellish facts, but they more often provide a useful contextual framework, a reference to the past and a comparison across the present. 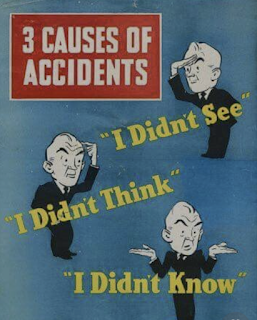 The post-WWII period is special in political history. Instead of sovereign conflicts driven by self-interest, the world engaged in a successful experiment in multi-lateralism using world organizations to facilitate cooperation and resolve conflicts. This dominance of classic liberalism, albeit at times imperfect, was led by the United States, which showed exceptionalism by furthering this global view and not normal imperialism. For most everyone, consumers, investors, and companies, this liberal order was a boom for finance and economics. 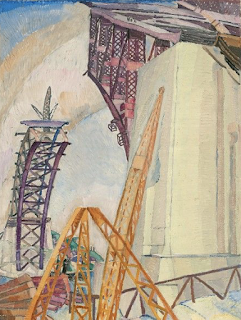 This tremendous economic success, especially as we moved away from the commanding heights of controlled economies, lead to strong global growth, the successful distribution of goods and services, and lifting of many out of poverty. Trade growth increased, capital has flowed freely around the world to support financial efficiency, and labor has had an opportunity to move to places where it can be best be employed. This was a great time to be an investor with an almost unlimited set of opportunities. Poverty has been pushed back to levels only imagined a few decades ago. Contract disputes are handled by courts and rules and not by might. Democracy has increased around the world. Again, there are plenty of examples of failure, but the liberal progress has continued for decades and has been institutionalized, yet this environment is fragile. It may not seem that way when the US stock market has continued to gain in the post Financial Crisis period, but the seeds of a reversals are present. Whether trade wars, aggressive financial statecraft, geopolitical aggression, the reemergence of bilaterism, the fall of democratic institutions, and the emergence of extremism, the liberal order is threatened and will wither if there is not outspoken leadership for a coordinated world order. The implications are severe for most investors. 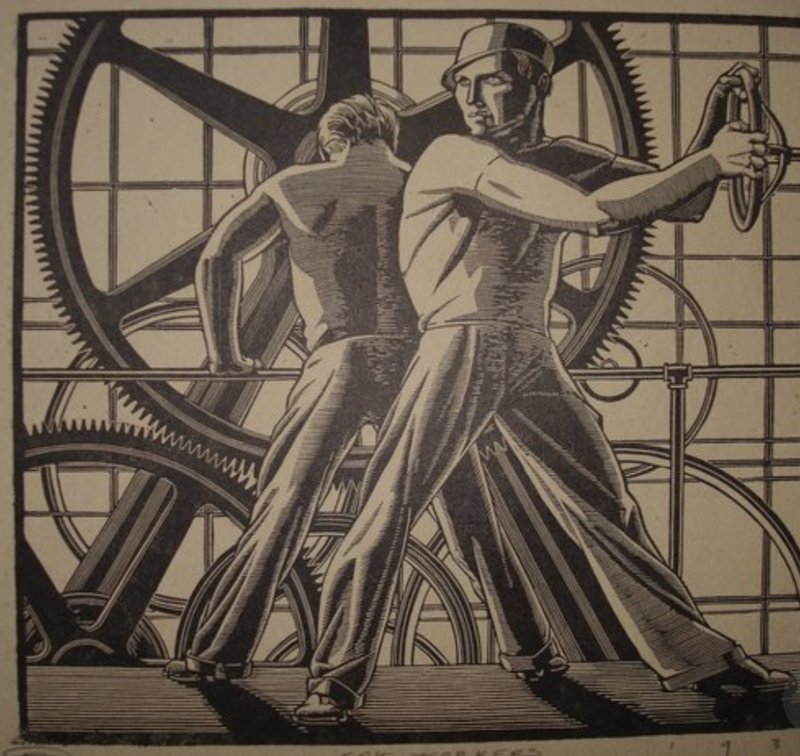 Without the free flow of capital, trade, services, and labor, productivity will be decline, growth will slow, and market frictions will increase. Returns will be forced lower not the mention the more critical issue of political health and safety. The impact will not just be felt for the rich but for all. The world will adapt to change, but the impact of deglobalization and the decline of the liberal order is a clear existential threat that will overhang all markets. 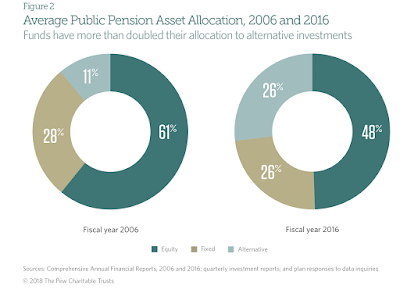 State pensions have changed their portfolio composition during the last ten years to increase their allocations to alternative investments, yet this adjustment has not helped them reach their targeted returns. This gloomy story was presented by the Pew Charitable Trusts State Public Pension Funds' Practices and Performance Report. Fixed income allocations have stayed stable, but there has been a switch from equities to alternative investments, yet this has not translated to better absolute returns. The alternative investments were supposed to give higher equity-like returns, but may have behaved more like enhanced fixed income. Perhaps the ideal return profile was never a true possibility. 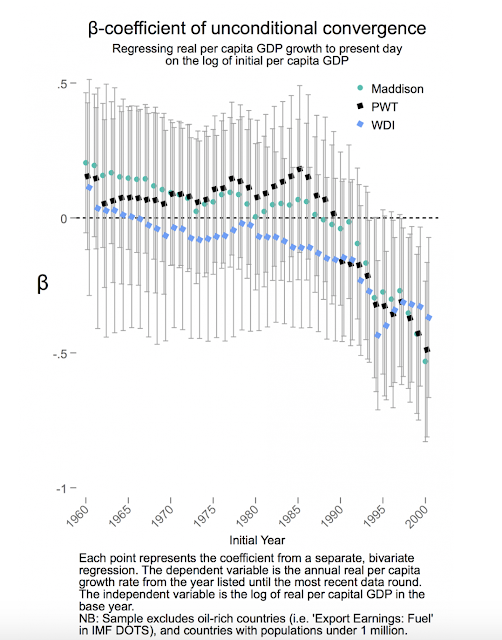 The return gap for many states has been significant. The only way the gap would have been closed would have been to hold large equity beta bets. In hindsight this may seem obvious, but in reality it was a risk states were unwilling to take. The half step was to increase alternative investments. Unrealistic returns expectations could be the reason for the funding gap, but the story is clear. States have a problem. They did not generate the returns actuarially expected and expected returns in a low fixed income and growth environment suggest that the gap will not be closed in the future. As the retirement pool increases, more funds will be needed for pay-outs and not available for future retirees. While some states have done a better job, no state has been able to exceed their return targets for the ten year period analyzed. States are aware of the problem and have lowered their funding return expectations, but these numbers are still high when you consider current yields and what may be reasonable equity return assumptions. The challenge and burden for alternative investing is whether strategies can be employed to close this funding gap and meet some absolute return targets. With over $3+ trillion invested, all state pension funds may not be able to succeed at raising returns without taking greater risks. There just may be too much money chasing limited return opportunities. Everyone cannot have special investments. 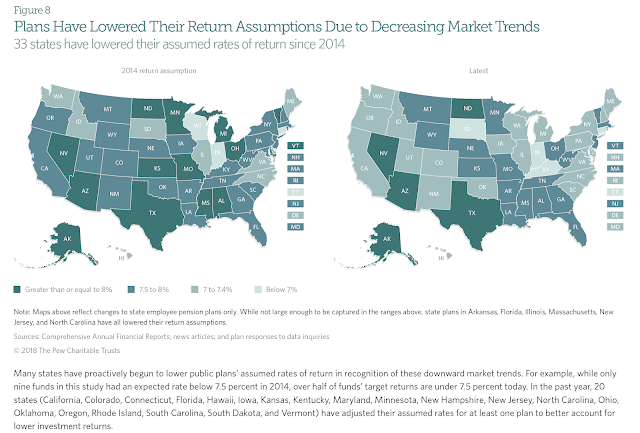 Nevertheless, each state has to try and find a mix that will lower risk and boost returns. There is no question that the explosion of corporate debt has caught the attention of many investors. This debt growth has been especially strong for BBB-rated companies which on the cusp between investment grade and high yield. Yet, like the boy who cries wolf or the doomsayer who is predicting the end of the world, warnings of a credit crisis do not seem to have affected investor activity. Corporate spreads are still tight and the reach for yield has continued almost unabated. Investors have not been given reasons to care about this debt issue today and have pushed any risks into the future. The potential risk for credit is always front and center with any discussions about a new financial crisis but usually the conversation stops there. There is less discussion on what is going on under the hood with respect to credit markets. 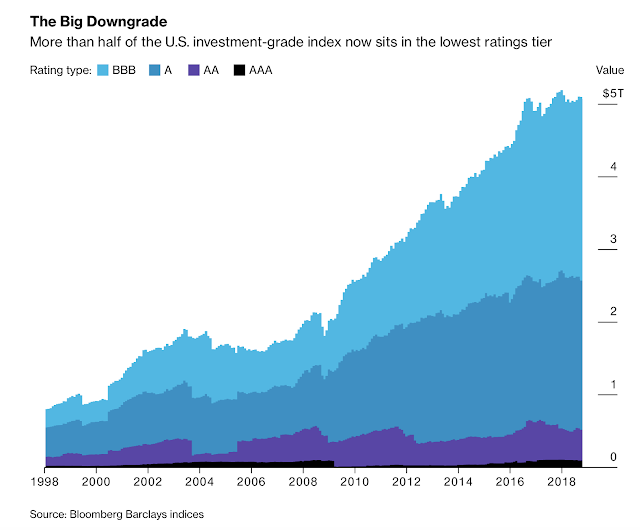 A recent Bloomberg story highlighted some of the issues that should frighten any investor, see "A $1trillion dollar powder keg threatens the corporate bond market". This article outlines one scary feature of the added debt; the junk bond leverage for some investment grade firms. This article suggests that rating agencies are not doing their job. We have seen this story before with rating agencies and structured finance. The story implies that when the next macro shock occurs, there are some very large issuers who will see significant declines. The size of debt may not increase the likelihood of a negative shock. The increase in debt changes the sensitivity to any credit or macro shock. The increased shock sensitivity is what should be feared. A simple walk through of some scenarios shows why investors should be concerned. A lot of this sensitivity spills over to equity markets, which will have a macro wealth effect. The refinance effect - Much of this corporate debt will have to be refined in an environment that will have higher interest rates; consequently, the cost on firms will increase and push down earnings. Funds will have to be used to delever, or marginal companies may not be finance this new debt. Not a problem today but the earnings sensitivity to rates will increase in the future. The index cram down effect - With much of the debt being financed by BBB-rated firms, any downgrade will have costs for investors as portfolios will have to be restructured. Spreads will widen on the pushdown of debt that was investment grade but dropped to high yield indices. For some investors who have yield restrictions, there will have to be a sale of the debt which will have a flow effect. The optionality (Merton) effect - Given the Merton liability model of the firm and optionality, equity is viewed as a call option on the value of the firm and debt is a short put option. An increase in leverage makes debt more sensitive to any increase in equity volatility. An equity shock will impact debt holders. The leveraged equity effect - Leverage will increase the riskiness of the firm, which will impact stocks, if there is any macro shock given the costs of restructuring and bankruptcy. 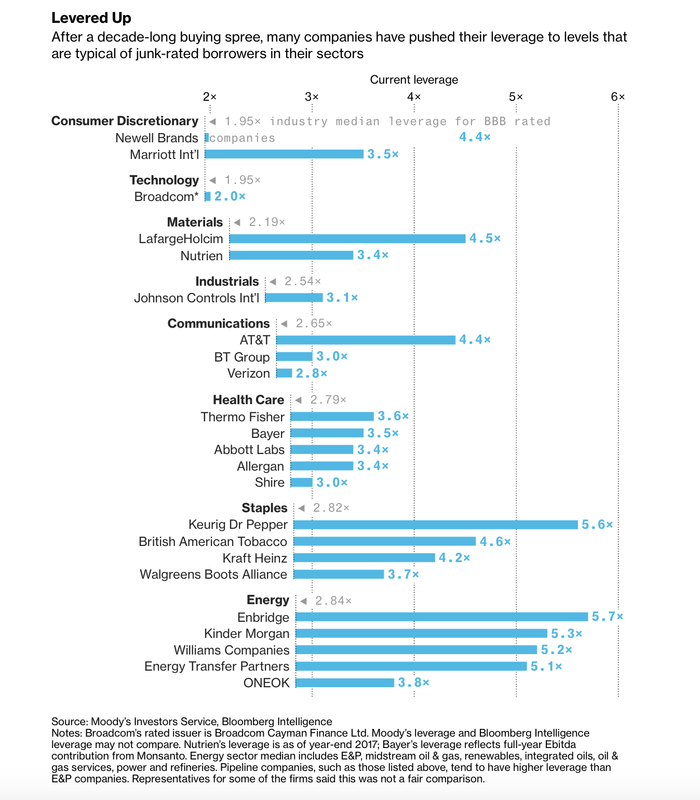 Marginal lending will not be available to these firms. The covenant effect - The demand for debt allowed a reduction in covenant protections. The impact of covenant-lite bonds is straightforward. The covenants add warnings, early protections, and restrictions that all help bondholders. If these are gone, risk increases. While some empirical work suggests that there is no effect from fewer covenants. The testing has not been under stress scenarios. Regulators have asked banks to restrict covenant-lite lending, but the practice continues. 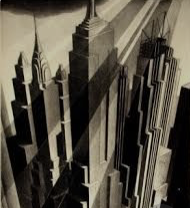 The shadow banking effect - The demand for credit has outstripped the supply available from banks, so hedge funds and private equity have moved into the lending space. The impact of these new players is unknown. My banking experience has always told me that one bank loan chews up the time and resources associated with underwriting many good loans. 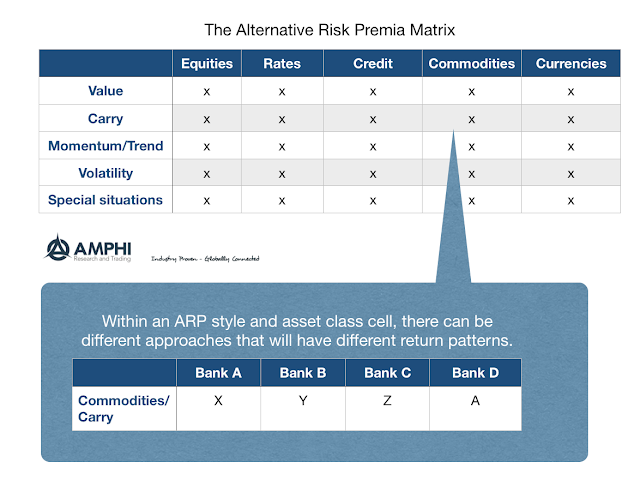 An alternative risk premium (ARP) matrix is an effective way to start any portfolio construction exercise. 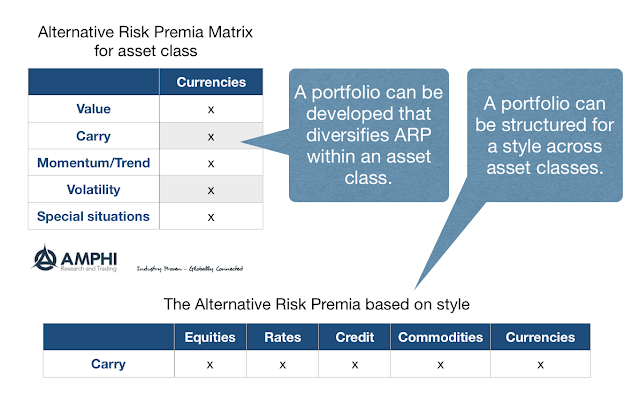 A matrix divides risk premia through two criteria, asset class and style. We think in terms of a 5x5 style/asset class matrix. The asset classes include: equities, rates, credit, commodities and currencies. These asset classes have inherent differences that make them unique even when looking through an alternative risk premia lens. For alternative risk premia we include: value, carry, momentum/trend, volatility, and special situations. These styles are been well-defined and identify risk premia that can be exploited through forming long/short portfolios and are actively traded and structured through the bank swap market. The matrix can create a broadly diversified portfolio across style risk premia found for each asset class. Full diversification would include a range of styles across a broad set of asset classes. An allocation can be made to each of 25 buckets in a 5x5 construct. However, an asset class specific portfolio would diversify across styles and a style specific portfolio will invest that style across all asset classes. Investors can think in terms of specific asset classes or styles to form different portfolio combinations. For example, in the currency asset class, there are well-defined risk premia that include: value as defined through purchasing power parity; carry through long/short portfolios based on interest differentials; momentum and trend premia based on past price action; volatility premia based on option implied versus realized volatility; and special situations associated with curve plays and liquidity. A similar matrix exercise can diversify a given risk premia style across asset classes. For example, a portfolio focused on momentum and trend could include allocations in each of the five asset classes identified. Correlation or cluster analysis can be used to find risk premia, which are uncorrelated, in order to form a diversified portfolio but a risk premia matrix can serve as theoretical basis for portfolio construction. This approach is especially helpful as the set of risk premia expands. Nevertheless, the risk premia for specific styles and asset class across a number of bank swap providers may not be all the same. Banks which offer risk premia through swaps may create different portfolios to represent a given risk premia. Within a given style and asset class, there can be a cluster of banks that offer different risk premia products. Some may be closely correlated while other can be very different. 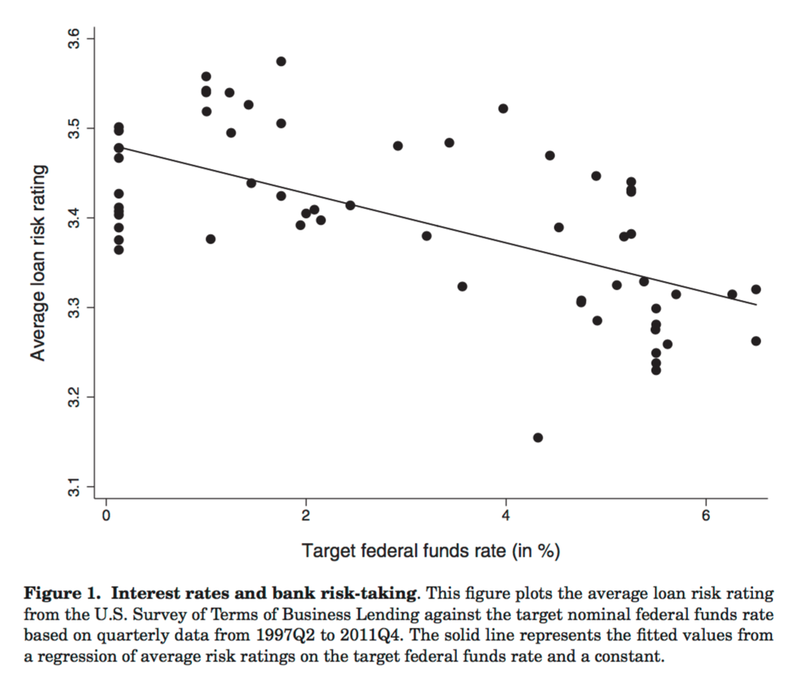 For example, one bank may not define the alternative risk premia for rates carry the same way as another bank. Additionally, the markets included in the swap index for a given style/asset class combination may differ across bank providers. These swap differences for a specific ARP is a source of competition and differentiation across banks. The portfolio matrix and structures should account for the differences across ARP products within a styles and asset class bucket. This adds bank specific differences to our portfolio matrix but it does not change the overall story. This framework, albeit simple, provides a useful tool for creating a scaffold for forming a portfolio structure. President Trump mused that it would be "crazy" for the Fed to raise rates in December, but his comments miss the point on how the Fed is operating. The continued themes through Fed forward guidance are caution and flexibility. Investors are looking for certainty about the policy path, but the Fed is only going to give fuzzy guidance. Policy will be adjusted slowly so as to not make a mistake. There will be no rules that will bind behavior. When in doubt, do not change from the status quo. We are still living a Yellen Fed world. This was clearly stated a year ago at one of former Fed Chairman Yellen's speech at an ECB conference. “In my experience, market participants are very interested in knowing what the path of policy will be and when changes will be made either in asset purchases or in the policy path. And that’s something that central banks are loath to provide." 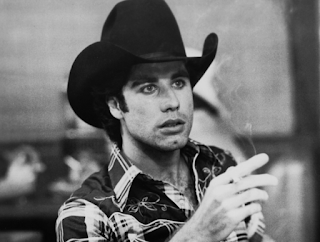 Names and faces may change, but the behavior of the Fed usually does not. If you are expecting something to change with a new Fed Chairman, you will be disappointed. See Chairman Powell's comments at the Jackson Hole conference. He is comfortable with a cautious Fed based on the old Brainard principle that when uncertain about the effects of policy move more conservatively. "In retrospect, it may seem odd that it took great fortitude to defend “let’s wait one more meeting,” given that inflation was low and falling. Conventional wisdom at the time, however, still urged policymakers to respond preemptively to inflation risk even when that risk was gleaned mainly from hazy, real-time assessments of the stars." However what is different is that some of the underlying guideposts such as r-star have been deemphasized. Do not expect any short-term reaction to changes in macro data. Do not expect a reaction to the recent volatility in equity and fixed income markets. While there may be more focus on what the Fed might do, investors should work under a prior of no change from current policy. When in doubt, fade Fed action especially if the markets respond to data still in a broad range of tolerance. Fuzzy criteria on what data will drive policy given it may be noisy, fuzzy models on what is the neutral rate of interest, and a fuzzy reaction function that does not bind the Fed to inflation, growth, or asset market behavior is still the order of the day. r-star is out and bond trading is in!